The Caribbean is a great big playground, and Carnival's shore excursion brochure lives up to this image. Before I flew out to Miami for my Carnival Breeze cruise, I scoured through the options to see what excitement awaited me. Alas, when you travel with young children, the number of exciting options drops significantly. After children reach the age of between six and eight years old, most of the exciting excursions are available to purchase. Children young than this will inevitably be limited to sightseeing bus trips or 'private' beach transfers. Based on my trip with my two-year-old, here are my top tips when choosing what to get up to with your family in the Caribbean. I love pre-booking - and importantly pre-paying - my shore excursions as it means everything is taken care of before I step anywhere near the cruise ship. I know my tickets will be waiting for me and when I disembark the ship, I do not have to worry about the bill. But as my son's mood can change in an instant, pre-booking excursions is not as sensible as it once was. The 30°C heat and bright Caribbean sunshine meant he had some good days mixed with some bad days when exhaustion crept in. I purposefully pre-planned very few off-ship activities as I anticipated this. If I had pre-booked Carnival shore excursions and then cancelled on the ship, I would have incurred cancellation charges calculated on the value of the prepayment and the amount of notice given. The disadvantage of not pre-booking is that you may find there is no availability on the excursions when you book them onboard. If there is something you desperately want to do at all costs, pre-book this. Read the excursion description very carefully and ask yourself "will everyone in my family enjoy this?". Kids can be fickle, and it can either take a lot or a little to amuse them, depending on which direction the wind is blowing. Children might not mind a short bus ride, but a four-hour sightseeing trek might push them too far. Similarly, swimming with dolphins might sound like a dream activity, but if your kids are water-phobic, this is perhaps not the best idea. The best shore excursions are those that ticks boxes for everyone participating. Plan activities with something for everyone in your group. Value trumps cost. When booking cruise holidays, I have always begun my search looking at the cheapest options, settling on the ones that represent the best overall value. The same goes for excursions. Before I was a dad, I wanted the best bang for my buck, so I opted for the longest and most affordable trips. Invariably these were sightseeing bus tours. But with a child, I cannot spend hours cooped up on a bus touring an island. Cheap may well be cheerful but affordable may well offer the best value. It is no secret that cruise line shore excursions are usually more expensive than private counterparts. Part of that extra cost buys peace of mind, and, wherever possible, I stick to official trips. When visiting St Maarten, there was only one place I could take an aeroplane-obsessed two-year-old: Maho Beach, at the foot of the runway at Princess Juliana International Airport (SXM). I could not find any suitable official Carnival shore excursions, so I had to scour the web for a private tour instead. 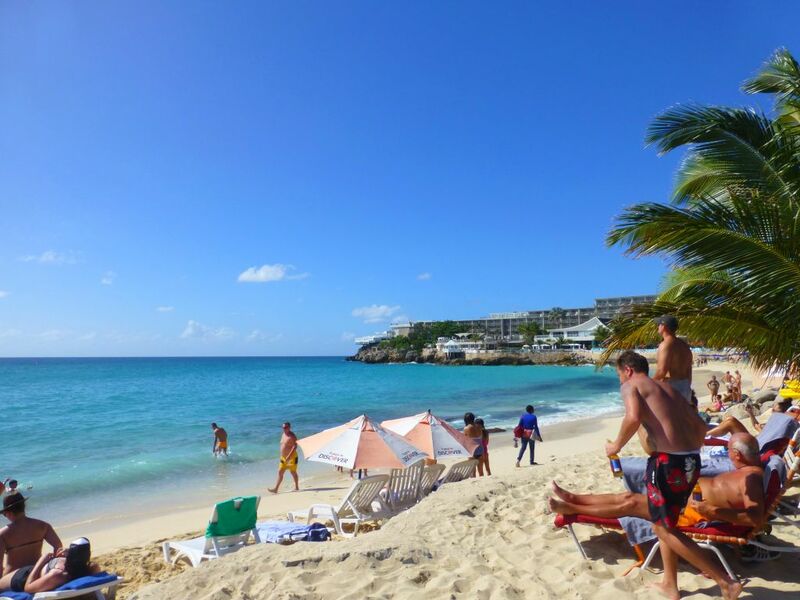 I stumbled across the St. Maarten Famous Maho Beach Break Excursion from Shore Excursioneer and it ticked all the important boxes - cheap, short, basic, and reliable. After I had paid, it transpired that Bernard's Tours, one of the best-rated tour operators on the island, was behind the trip. In essence the excursion was a shared shuttle bus journey from the port to the beach and back again. The driver was friendly and chatted with us although the promised photo stops at Simpson Bay Marina and Harold Jack Hill never materialised. At $50 (&thickapprox; £39) for the three of us I did not really mind. We had a great time at Maho Beach although finding shade was tricky. Planes of all sizes landed every 15 minutes or so and even though I did not see a Boeing 747 I did experience the rumble and roar of a passenger jet taking off. The beach is worth visiting, particularly if you or your kids have a fascination with aeroplanes. As long as you exercise caution (i.e. do not stand at the rear of the runway during take-off), you should have a very enjoyable time. Do your research. Several private excursion websites I visited claimed to offer a 'back to the ship on-time' guarantee, but not all of them looked reputable. Other sites offered no guarantees whatsoever (a risky option). Wherever possible, put together a plan B in case you miss your return bus, or it simply does not turn up. Plan B will always be the stressful and disappointing end to your excursion but knowing how to get back to the port, and how long it will take, means you can have peace of mind should you be in a position where you need to find your way back. When I headed to Heathrow airport to fly to Miami, I looked like I was moving house. Travelling as a trio has led to an alarming rise in the number of suitcases I now need to take. Sadly shore excursions are no different. The easiest things to forget include suncream, money, passports, sun hats, and sunglasses. Ignore these at your peril! Make sure you pack enough food and drink to keep your kids happy and hydrated. I pre-purchased a bulk pack of 12 500ml bottles of water from Carnival at a bargain $2.99 (&thickapprox; £3) and I took a bottle with us whenever I left the ship. Book a sightseeing tour and airport transfer all-in-one excursion at the end of your cruise. If you have got a long-haul flight home in the evening and you dock early in the morning, you could find yourself with a lot of time to fill. On top of that, you will need to lug around your suitcases, buggies, car seats, etc. all day long. Head straight to the airport and spend several hours staring out the departure gate window. Park yourself in a nearby bar and stay there for a few hours. Find a way to offload your luggage and then spend your time exploring such a great city. The sightseeing tour and airport transfer all-in-one excursion is option #3. I narrowed down my choice to two tours in Miami - a hop-on-hop-off bus tour, and a South Beach trip. Both were similarly priced and similarly reviewed. I ultimately opted for the South Beach tour. I loaded our luggage onto the bus, and that was the last I saw of it until I arrived at Miami International Airport, leaving me a few hours luggage-free to explore South Beach. For around $90 (&thickapprox; £70) I got a hassle-free coach trip from Port Miami to Miami International Airport via South Beach, a tour guide to explain what we were looking at along the way, and luggage storage. I also got to spend time on my own exploring South Beach - a civilised alternative to sitting in an airport all day long. Do you have any handy tips on things to do with children in tow in the Caribbean? Leave your suggestions in the comments below. Disclosure: Carnival Cruise Line supplied one return adult economy airfare, overseas transfers, one night in a Miami hotel, and cruise fare for two adults and an infant. I paid for one return adult and child airfare, meals ashore, private excursions, and domestic travel to and from Heathrow airport. My opinions are my own. Our family has been planning for a long time to have a private shore excursion to spend quality time with each other. We’ve never considered the fact that we should choose value over cost because affordable may well offer the best value. Moreover, though private excursions may be more expensive, it will also equate to peace of mind.